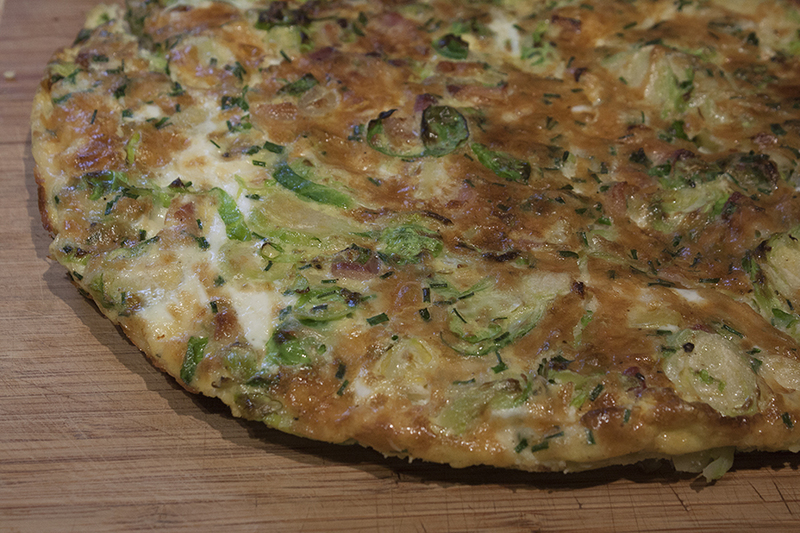 We changed gears a little bit and decided to make the Brussels Sprout, Bacon and Gruyère Frittata for lunch on Sunday, rather than for dinner. Tony describes how he made it. As I usually do, I started with all the prep work for this dish. We bought pre-shredded brussels sprouts, which saved a tremendous amount of time; I’m not sure I would have tackled this recipe if I had to do all of that slicing by hand. With that done, all that was left to do was dice the bacon, slice the shallots, grate the cheese, and chop up the chives. All of this took about 10 or 15 minutes. I also prepared the egg mixture by combining eight eggs with a little milk and salt and pepper. The recipe says you can do this step while the other ingredients are cooking, but I wanted to get that step out of the way. Once all this was done, I cooked the bacon in a skillet, which took about 5 minutes, as called for in the recipe. I added the shallots and cooked them for about 3 minutes, again as called for in the recipe. As the last step, I added the brussels sprouts. I probably cooked these for 7 or 8 minutes, which is a little longer than the recipe’s instructions, but I wanted to make sure they were soft. Plus, it took a little while to get them browned. I then added the grated cheese and chives to the egg mixture and stirred everything together to combine. I poured the eggs into the skillet and let them cook, stirring just enough to spread out the bacon and brussels sprouts. I did this all over fairly low heat, as I didn’t want to burn anything, so this step probably took a total of 9 minutes, versus the recipes 5 minutes, as I needed a little more time to make sure the eggs were not too runny before putting them under the broiler. I put the pan under the broiler and after about 2 1/2 minutes, the eggs has set nicely and browned just a little. I was a little nervous about getting the frittata out of the pan (I didn’t want to end up making scrambled eggs by default! ), but after running a flat rubber spatula around the edge of the fritatta a couple of times and also sliding it toward the center, the frittata slid out of the pan without too much trouble. The fritatta came out perfectly – light and fluffy and, despite having half a pound of bacon in it, not very greasy at all. The brussels sprouts were nice and soft and the Gruyère added an earthy note. My biggest concern about this recipe was that either the bacon or brussels sprouts would overwhelm the dish, but everything was in perfect balance. We had the frittata with brioche buns and a little Pinot Grigio, because we figured, we’re still technically on Christmas vacation, so why not have wine with lunch!